Our Drawstring Liners are premium polyethylene container liners that utilize a unique drawstring design to keep the liner in place, even under extreme conditions. Drawstring Liners can be utilized in rolloff containers, end dump trailers, rail gondolas, and lugger boxes. Custom liners can be made to fit almost any application. Securing the liner with the drawstring eliminates the problem of the liner falling into the container while filling or in adverse conditions. No clips, tape, or tie-downs are required to keep the liner in place. Our Drawstring Liners provide additional advantages. 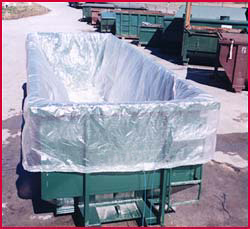 The unique drawstring feature can be used after loading as a way to close off the liner and encapsulate special waste streams.